. Published on June 22, 2018 . 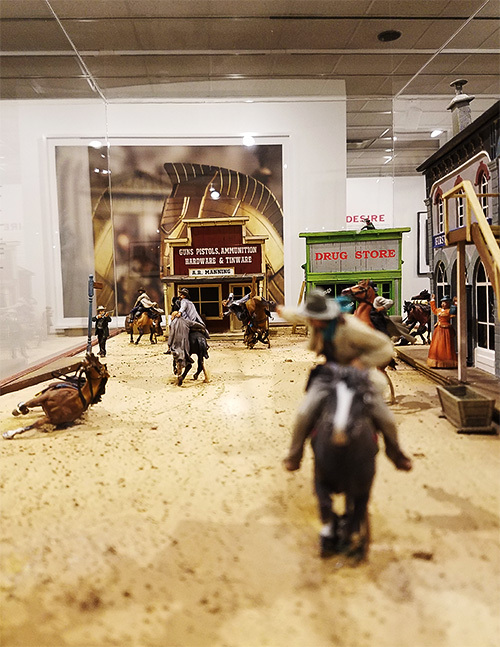 An example of one of that sets that David Levinthal photographs. Phew, it’s been a minute! The four weeks since the semester ended have been full of unexpected twists and turns in my life. I ended up flying out of town last minute to help with a family emergency. Unexpected travel is always an adventure especially when coming off the end of the semester whirlwind. The good news is that Chicago’s a super easy city to fly out of last minute. Now that I’m back home I’m looking forward to getting into a summer studio routine because…guess what?…I’m not really on summer break…I’M DOING AN INDEPENDENT PROJECT! Yea! Ok, let’s rewind for a minute — there’s much to share! While I was in upstate NY helping my family I saw an advertisement for an exhibition at the George Eastman Museum titled “David Levinthal: War, Myth, Desire.” When I looked up the museum hours I discovered David Levinthal was giving a gallery talk the very next day. I’m not a David Levinthal fanatic but I have a lot of respect for him and the career he’s built so I decided to go and hear what he had to say. 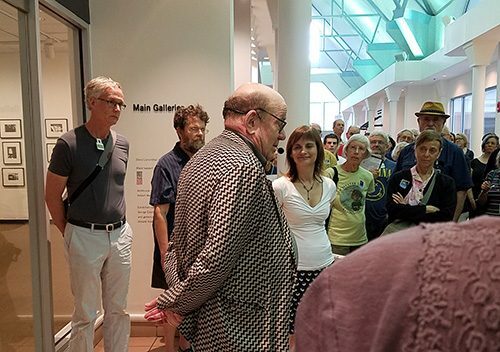 The gallery was overflowing with people as the museum staff scrambled to setup a microphone to help accommodate the crowd. Levinthal did not disappoint. For an hour and a half he casually talked about his life, practice, and the struggles he’s experienced as an artist. He was engaging and funny. He spoke clearly about his work and sprinkled in more than a few behind-the-scene stories about how various pieces were created. I was struck by his honesty. He spoke about giving up on his career as an artist after he earned his MFA and was unable to find a teaching job. Levinthal took an unconventional creative path by completing his MBA at MIT. It was humbling and inspiring to hear how he used business as a way to sustain his artistic practice when he wasn’t selling artwork and as a way to manage his career once he was. I’ve been settling back into real life the past few days and refocusing on my independent project. Independent projects are a great way to dive deep into a topic that isn’t otherwise offered as part of the curriculum. Independent projects do require time and thought to develop as you have to work with a facility advisor, have regular studio visits, and submit a project proposal. I’m really excited to see how my project develops over the next few months. I’ll continue to work a couple of part time jobs but most of my time will be spent in the studio. For my project I’ll be continuing to explore machine learning and computer vision, which I started experimenting with at the end of last semester. My goal is to research, experiment, and make as much as possible this summer. I hope to focus my body of work in preparation for thesis year. I’ll also be spending time silkscreening in the printmaking facilities and preparing for the undergraduate class I’ll be teaching in the fall. I can’t wait to get back into a routine and art-making in the studio. Oh, and also having a sunny picnic everyday in Grant Park!